Bandcamp Roulette is a weekly column where some of the most eclectic and unknown bedroom projects will be uncovered and reviewed with a random word search. It’s a lucky — or maybe unlucky — dip into the internet’s melting cauldron of ear-splitting lo-fi music, hidden rock ’n’ roll gems, DIY Garageband beats, and much more. It’s been a hard week for #Kanye. After cancelling an extensive list of anticipated Life of Pablo tour dates and reportedly hospitalised for his own safety, we wanted to do our own little shout out to ‘Ye with this week’s Bandcamp Roulette. Although always broiled in controversy for his comments about Beyonce, or Trump, or otherwise, Kanye‘s lasting influence on the rap scene is unmistakable and undeniable. I guess if Kanye didn’t release a Christmas album anytime soon, someone had to. ‘Tis The Yeezy Season by Demi Adejuyigbe is a mashup album, chockfilled with Kanye West and popular Christmas song remixes. The ten track compilation is technically set for release in December, but has apparently been made available early for all those who urgently desire Kanye/Christmas mashups. I had reviewed a sample-reliant album for Bandcamp Roulette before, and it had pleasantly surprised me, so I went into ‘Tis The Yeezy Season with an open mind. Like many other Bandcamp Roulette finds, this release was also esoteric and amusing, but there were clear differences from the usual pick of the litter. One of those being that this week’s artist was not some unknown bedroom-dweller surrounded by Doritos chip packets and lit by the cold, flickering burn of a computer screen: Demi Adejuyigbe is, in fact, fairly well-known, but not for his music. Adejuyigbe is a popular comedy writer for NBC’s The Good Place and the host of Gilmore Guys, with an impressive social media presence to match — we even shared mutual followers. His Bandcamp profile seemed to be a host for his comedy songs or creative remixes, noteworthy mentions being UPTOWN FUNK YOU UP! (a bunch of mashups of ‘Uptown Funk’ mixed with other artists like Smash Mouth or Red Hot Chilli Peppers), ‘Carly Rae Death Grips’, and ‘Eminescence’. The second difference between ‘Tis The Yeezy Season and Bandcamp Roulette predecessors was its obvious and upfront declaration of comedy. In the album’s edited description, Adejuyigbe has added “(I deleted ‘Little Saint West’ because it was very bad. And this is already all pretty bad, so imagine how bad that one is. )”, reflecting his relatively laissez-faire, modest attitude. The mixtape is blatantly tagged #comedy, as well as #what’s the point of these tags and #who comes here for the xmas, absolving itself of any serious criticism. But oh well. ‘Tis The Yeezy Season is a bag of tricks: some good, some bad, some missable and boring, in one ear and out the other. Adejuyigbe‘s ability to know which Kanye songs go best with which Christmas classic is hit or miss, and when they do go well together, it’s not the funniest or the most inventive combination: best described as a soft chuckle or a small, rhythmic nod. ‘Merry Westmas, Happy Holidays‘ is on the good end of this spectrum (still a soft chuckle, but definitely a tap of your foot). The song takes NSYNC‘s ’90s pop grooving ‘Merry Christmas, Happy Holidays’ and West‘s already funny ‘The New Workout Plan’, and because of the slow, cruising bars and light-hearted nature of the latter, the two make a great mashup. ‘Wonderful Westmastime’ is also another lucky track. At first glance, the biblical imagery and politically charged lyrics of ‘Jesus Walks‘ may seem an ill fit to Paul McCartney‘s ‘Wonderful Christmastime’, but what weighed down McCartney‘s classic was his ding dong, fairylike, facile words, and this replacement makes one appreciate the original cuckoo space synth sound. ‘Carol of the Yells’ is arguably the funniest on the album, but isn’t really a mashup at all. 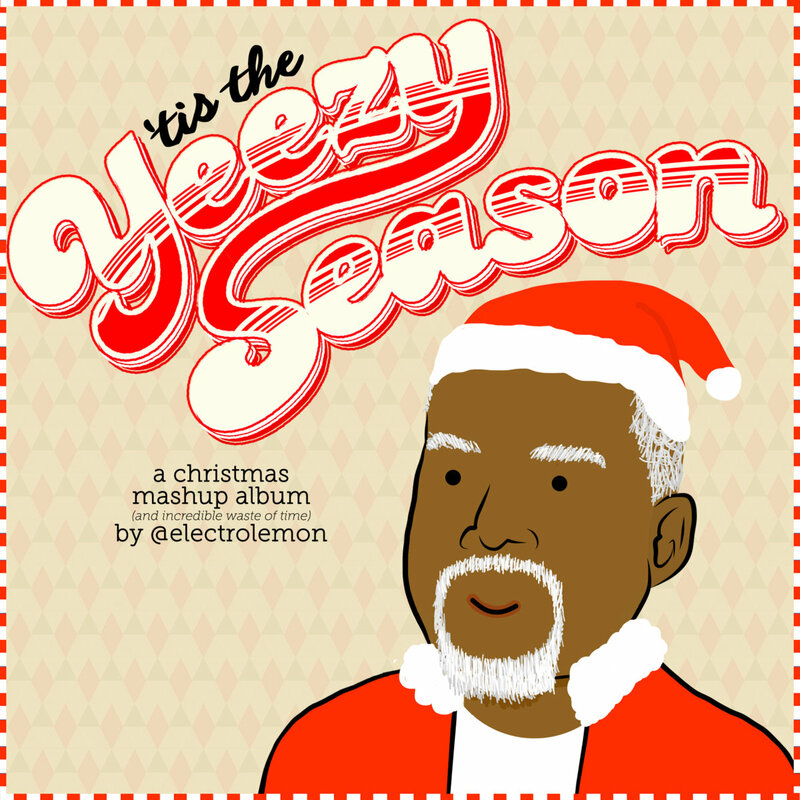 Instead, it’s Kanye‘s iconic grunt remixed to the melody of the quaint ‘Carol of the Bells‘. Adejuyigbe apologises with “Uh. I’m sorry about this one.” in the description, but he doesn’t have anything to be sorry for with this track. It’s genuinely hilarious, a play on Ye‘s often parodied repetitive noises and the orthodox, family-friendly Christmas classic. Adejuyigbe loses this when he tries to make an effort to meld Kanye‘s own electronic stylings with pop rock or ’70s soul. The result, as showcased in ‘This Westmas’ and ‘A Ye Big Sled‘, is a contrived and confused mess; just not right. The robotic croaking of the Daft Punk sample from ‘Stronger‘ does not mesh with Donny Hathaway, and his painfully autotuned vocals also struggle to sit well with The Killers. Demi Adejuyigbe is a funny guy, no doubt about it. But he shouldn’t rely on the very simple matter of Kanye West being mashed up with Christmas songs for the comedy factor, and should not expect the amusement to last throughout all ten tracks. Each song needs to have its own comedic innovation, and while there is the occasional hidden gem, unfortunately, ‘Tis The Yeezy Season fails to do this completely. 5/10 painfully awkward Christmas dinners.